Students of all abilities performed in front of The Music Center’s Walt Disney Concert Hall and celebrated their artistic achievements as part of The Music Center’s Very Special Arts Festival. Los Angeles, CA 10/20/2017. The festival featured continuous student performances on an outdoor stage in front of The Music Center’s Walt Disney Concert Hall, along with numerous visual and performing arts participatory workshops led by both professional teaching artists and high school students. Students also enjoyed performances by Ballet Folclorico Do Brasil; magician Allen Oshiro; dance lessons and face painting by Los Angeles County High School for Arts students; mask, hat, and puppet making; a disco; and much more. During the event, Grand Avenue came alive in front of the Concert Hall with a wide range of student performances, including instrumental, vocal, dance and other presentations. The younger students also enjoyed interacting with a number of high school students, including visual arts and theatre students from Los Angeles County High School for the Arts (LACHSA), which sponsored a face painting workshop; and LACHSA dance students who conducted dance lessons for the students at an on-site disco. 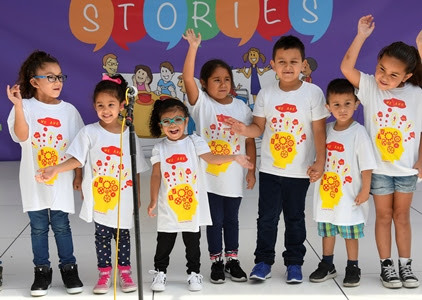 The Music Center’s Very Special Arts Festival is produced in partnership with the Los Angeles Unified School District and the Los Angeles County Office of Education. Schools throughout Los Angeles County with students in grades K-12 are invited to participate. Support for this year’s event comes from the City of Los Angeles Department of Cultural Affairs, LSMK Investments, The Music Center Leadership Council and the Kenneth T. and Eileen L. Norris Foundation. The festival is part of The Music Center’s longstanding, multi-faceted arts education program that serves students and teachers throughout Los Angeles County. The Music Center convenes artists, communities and ideas with the goal of enriching the cultural lives of every resident in Los Angeles County. The non-profit performing arts organization has two divisions: The Music Center Ops, which manages The Music Center’s four theatres, an outdoor plaza and Grand Park on behalf of the County of Los Angeles; and The Music Center Arts, which curates a world-class dance series, Glorya Kaufman Presents Dance at The Music Center; produces and presents programming in other arts genres with a focus on engagement; and presents nationally recognized arts education. The Music Center is also home to four renowned resident companies – Center Theatre Group, the LA Master Chorale, the LA Opera and the LA Phil. With The Music Center On Location,™ the non-profit performing arts organization brings events and activities to locations outside of its Downtown Los Angeles campus. For more information, visitmusiccenter.org Follow The Music Center on Facebook, and follow @MusicCenterLA on Instagram and Twitter.